If you thought Antarctica was a shell of frozen white and blue, that a look at these surprisingly colorful pictures by photographer Gaston Lacombe. 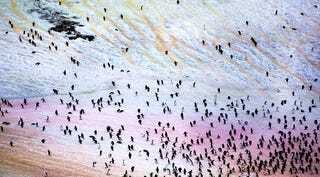 Taken over a two-month visit to the continent, the white is painted by brushes of algae, penguin poo and krill. He told us how this hue magic happens. When I was invited by the government of Argentina to be an artist-in-residence on one of their bases in Antarctica, I was planning for many days photographing a bleak, white landscape, since that is the image we are always presented of this faraway continent. Instead, I found a place full of life and color. I was not photographing from a boat, as nearly all other photographers who visit Antarctica do, instead, I was living and experiencing this place from land, day after day, throughout the Antarctic summer. During the summer months, as the sun shines and winds blow, the landscape can change its appearance in a matter of minutes. Microscopic algae lives in the snow and ice, and when the sun warms the surface of the glaciers, these plants bloom in huge plumes of red and green, coloring the glacier's surface like splashes of paint. I even once saw the glacier next to the base turn completely red, but only for a few fleeting hours. As soon as the cold returns, the microscopic algae return to a dormant state inside of the ice. The penguins also do a great job of painting the landscape, dragging all sorts of colors with their feet as they shuffle between the nesting colony and the beach. Going to and from the beach, the penguins drag mud around, tracing trails of various shades of brown and orange all over the snowy surface. Then, most notably, the penguins bring a lot of pink to the environment. They eat krill, which is a small type of shrimp. The krill is pink when they eat, and it is also pink when it comes out of the other side. Yes, penguin poo is pink, and this sludge covers the whole colony. So, as penguins leave the colony, they trail a lot of pink around with their feet, tracing highways of pink all over the snow and glaciers. I was very fortunate to have all of this time to think about new ways to show the place, and return to the same photogenic spots day after day. Since we all know what penguins look like, I was trying to find a new, more innovative way to photograph them. I found a cliff overlooking the penguin colony, from where I could see the coming and goings of the penguins from a distance. I started to concentrate more on the penguins as elements in the landscape, that create patterns and movement, instead of on them as individual animals. That is when I created what I call my "Penguinscapes," which look at the multitude of penguins more as a design element in the landscape. Antarctica in general is not necessarily an obvious place to photograph. It's mostly a lot of rocks and ice. It took me a while to start seeing and appreciating the changing landscapes, and to develop the patience to find the best locations, the best times, and extract photos from these situations. In fact, my first few weeks there were quite disappointing, since I was looking for the obvious, and not adjusting my way of looking through the viewfinder. It would have been the easiest thing in the world to take a few photos of icebergs and call it a day. Instead, I started to walk long distances everyday, always within the accepted and safe boundaries of the base, sometimes 12-14 hours a day, looking for new ways to photograph this still little-known continent. The one issue I had was with my computer which promptly died as soon as I arrived in Antarctica. With the radio communications guy at the base we were able to fix the fried circuits enough so that I could upload my files to a hard drive, but I was not able to look through my photos while I was there. I came back with over 20,000 un-edited stills, and about 30 hours of video. It then took me nearly 3 months just to look through all of that material. Gaston Lacombe is an award-wining photographer and filmmaker specializing in documentary projects. Born in Canada, he is now based in Washington DC. He studied holds a B.A., M.A., and Ph.D. in History as well as a degree in Photography. His main interests include travel, exploring the often complicated relationship between people and animals, and the preservation of human memory. He is also the Communications Coordinator for the International League of Conservation Photographers. You can visit Gaston's website, read or purchase his blurb book about his trip to Antarctica or order prints by emailing him directly.